Just over 30 years ago I moved from Vancouver Island, to put down new roots on the much smaller island of Gabriola. A west-coaster from birth and an islander all my life, I continue to love this little jewel of a place, afloat in the Salish Sea. And on an almost daily basis, I continue to find photographic inspiration here – which is why I’m focusing my new show (opening Feb. 16) on images of Gabriola. 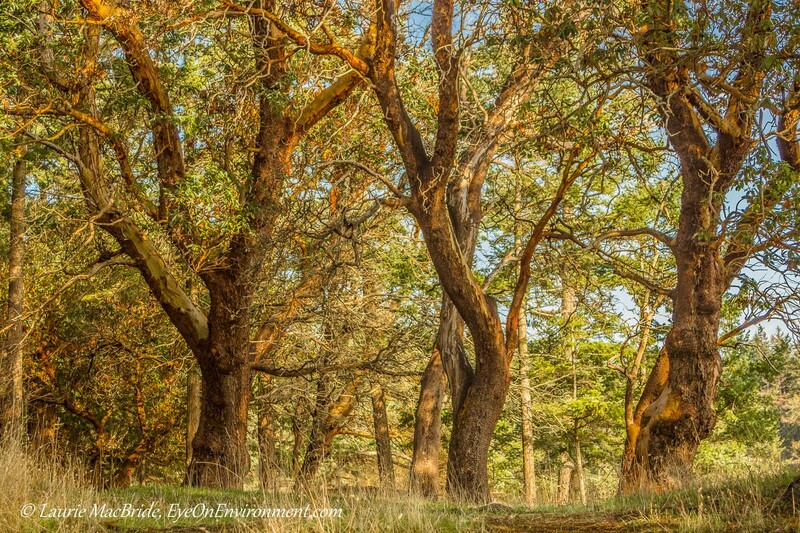 “The Dancers”, shown above, is one of five photos of Gabriola’s Drumbeg Park in the show (which has over two dozen mounted prints in all). Known affectionately to old-timers as “The Rock”, Gabriola is only 57 km² (22 miles²). But though it’s small, it offers plenty of opportunities for appreciating the natural wonders that are all around us: our fellow creatures and the plants, forests, wetlands, meadows and shorelines of this island home. We’re the northernmost of BC’s Gulf Islands, just a short ferry ride from the city of Nanaimo, over on “The Big Island”. This means we’re lucky enough to have the best of both worlds: the faster pace of city life when we want it (though I seldom do), and the rest of the time, the relatively unspoiled environment and serenity of island life – a place to breathe deeply, remember our place in nature, and enjoy the photographic opportunities on offer. My new show is entitled “Afloat in the Salish Sea: Images of Gabriola”. It opens Feb. 16 and runs until March 30, at the Gabriola Health Centre, 691 Church St. (downstairs). If you’re on the island I hope you’ll stop by to see it – open Mon. to Fri., 8:30 am to noon. Posted by Laurie MacBride, Eye on Environment on February 11, 2015 in BC coast, Gulf Islands and tagged arbutus, Drumbeg Park, Gabriola, Gulf Islands, home, islands, nature, photography, photos, places, trees. thanks so much! It wasn’t lost, but for some reason it went for moderation before it was posted. Oh my, Laurie. The Dancers are so beautiful! I love this image. Have a wonderful show! I wish I could be there to see it (and your island) in person. I wish you could too, Robin – it would be wonderful to get to meet you in person! Thanks for the kind words. You have truly found the good life…A bit of the world I need to explore. Thanks, Charlie. Of course, you have the San Juan Islands at your doorstep and they are also very beautiful! I only wish I could see it in person — your show and Gabriola! Love the title of the show and The Dancers! All the best with it! Thanks, Sherry! I wish you could be here too!